Say, you belief in the mission of an organisation that aims to elevate poverty, or any other project or idea that you have trust in and that you would like to see to have more impact on the ground. A question then is how do you now how impactful your contribution to that mission is? Apart from supporting that organisation, you could spread the message so friends become enthusiastic about the organization as well. 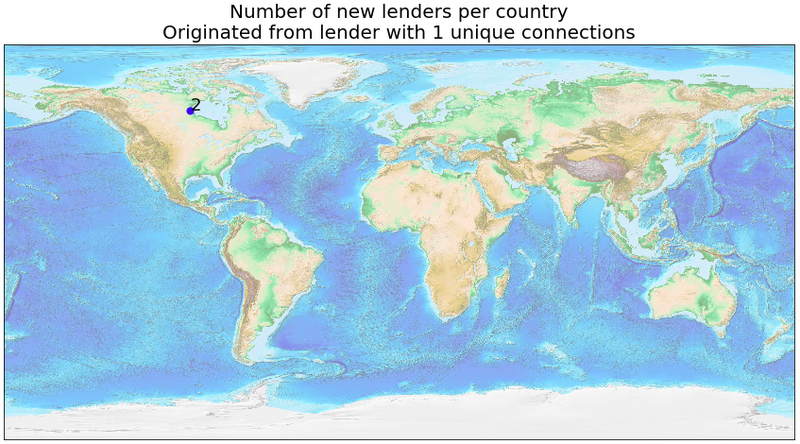 The goal of this post is to show the number of new lenders on kiva.org that originated from a single lender and visualize this result on a map. From there, one could explore the direct impact of spreading the message, for example, how many funded loans this generated and how many new borrowers received their loan through Kiva. For the analysis I only looked at new lenders that came to kiva.org via a referral and collected there location. In some cases a new lender receives a referral from multiple lenders. To prevent new lenders to appear twice, I only selected the connections where the new lender made a loan closest to the registration date. Furthermore, to save time I only selected lenders that made between 10 and 20 loans. Given all these connections and there locations I create a table that searches whether each invitee referred another new lender, which gives me a new table that I append to the original table. Then I group all new lenders by their country of residence and plot this information on the map below. Append dataframes of connections and group by country. Use Basemap from matplotlib to create the map. Here, I chose a lender that made many referrals. But I also want to know which lenders have lenders that also referred new lenders. 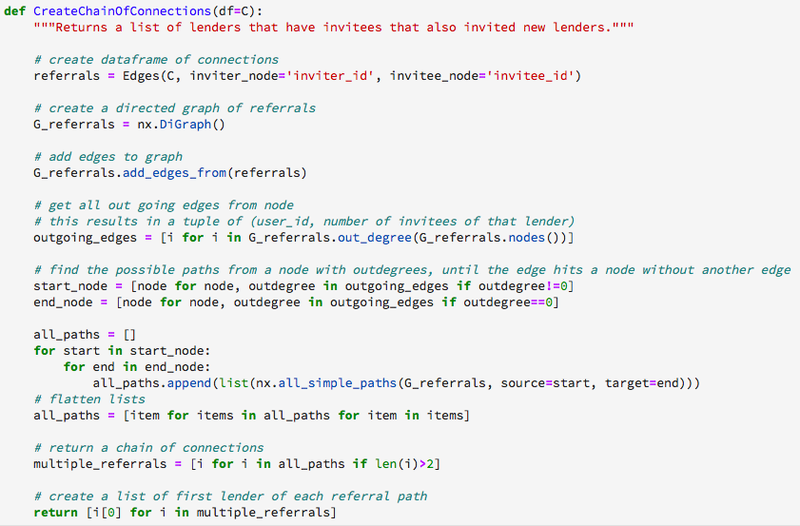 In order to do that I use a network graph to compute all the possible paths from an existing lender to a new lender that did not lead to a new lender. You could see this lender as the end destination of a path. By looking at all the possible paths I’m only interested in the lenders that created a chain of new lenders of at least two. Once I have extracted that information, I’ll plot the new lenders again on a map, see below. Use NetworkX to create the graph. Find all nodes with outgoing edges and nodes without outgoing edges. Then search for the longest path between these nodes for each node with outgoing edges. Select only lenders that have a chain of connections. Although the first lender in this chain referred one new lender that became enthusiastic about Kiva, this lender also referred another lender and both lenders made between 10 and 20 loans. Analyzing such a social network becomes really valuable in not only measuring your personal impact, but also in understanding the characteristics of lenders with many, or strong, referrals. In this analysis I looked at lenders, but the same impact can be obtained if we apply this method to borrowers. For example, how many new borrowers would be attracted to kiva.org? And would there be a relationship between a strong network, loan amount and making the transition to a formal bank account? I strongly belief that by leveraging these social networks giving a loan or a donation can become only more fun to do!